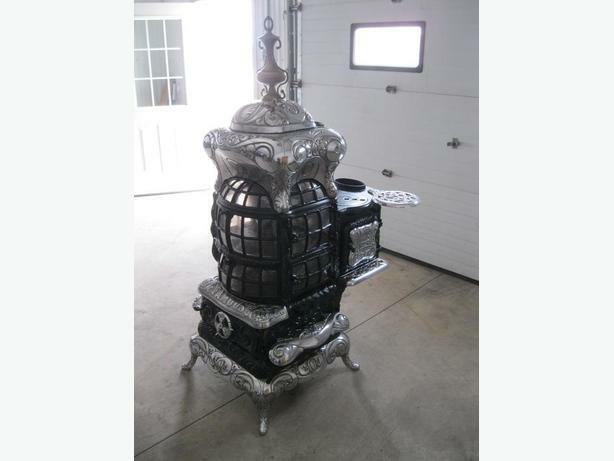 Rare Late 1800's McClary Famous Base Burner Parlor Stove with a Piggy Back Oven. Burns coal or wood. Manufactured by McClary, London, Ontario. The back oven has 2 top lids for cooking on the top & 2 oven doors with the rack. Stove in very efficient & functional & would really hold the heat as it is 100% cast iron. It measures 5 ft 4 inches high x 27 inches wide x 36 inches deep. There are 2 swing away pot holder trivets. Move the top & finial to the left & the loading door opens. It has 8 doors with mica windows for viewing the fire. Excellent firepot & grates for burning with no cracks. Bottom air controls & ash drawer. Viewing the Stoves is by Appointment. Contact Rick @ 519-842-5290 in Courtland for more Info.